The 152mm Glass Blue Spirit Thermometer (10 pack) is ideal for industries such as medical, pharmaceutical and social care. The pack of 10 means you have more than one to hand at all times. 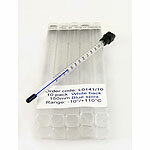 The blue spirit filling is ideal to differentiate between the different uses of thermometers to prevent cross contamination.